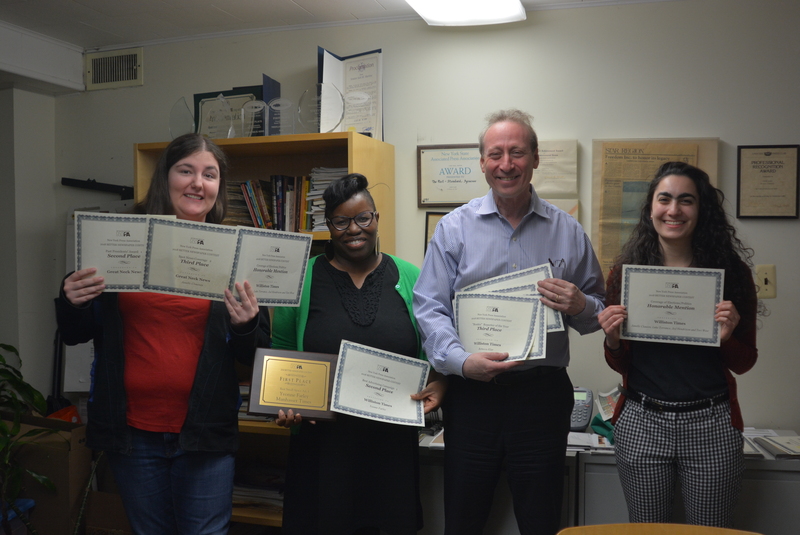 The Great Neck News was awarded second place for general excellence last weekend by the New York Press Association, an award that recognizes all aspects of the editorial product among its peers throughout the state. The award was one of eight that Blank Slate Media won across editorial and advertising categories in competition with New York weeklies and small dailies. Blank Slate cartoonist Matt Bodkin earned the top prize for his cartoon about former Nassau County Executive Edward Mangano’s corruption charges and graphic designer Yvonne Farley won first place in the small space ad category. Farley also earned second place in the best advertising campaign category. “My goal has always been to produce high-quality, visually appealing ads and editorial layouts, so it is especially gratifying to be recognized amongst so many talented designers in this competition,” she said. Former Williston Times and New Hyde Park Herald Courier reporter Rebecca Klar earned third place in the “rookie reporter of the year” category. Judges gave accolades for a first-person story she wrote about donating a kidney to her father. Great Neck News reporter Janelle Clausen took third in “spot news” coverage for covering Fire Chief Ray Plakstis Jr.’s death. Former Manhasset Times reporter Amelia Camurati won honorable mention in the spot news photo category. Clausen and Teri West and past reporters Luke Torrance and Jed Hendrixson together won an honorable mention for coverage of elections and politics. The New York Press Association presented the annual awards in 65 categories in Albany. There were a total of 2,743 entries from 163 newspapers. “I’m very proud of the staff and pleased that they received the recognition that they so well deserved,” said publisher Steven Blank. Last December when Clausen learned that Plakstis had died, she called his family and colleagues to write an obituary. With those conversations, she painted a portrait of a selfless, active individual much loved by his community. The next week, she completed it by documenting the 9/11 responder’s funeral, which drew mourners by the hundreds. Clausen said she was happy to win an award for her reporting but was even happier when Plakstis’ family gave her positive feedback when her stories were published. As for the general excellence award her newspaper won, it is representative of the weeks full of phone calls, meetings and writing that she has dedicated to the Great Neck News over the past two years, she said.